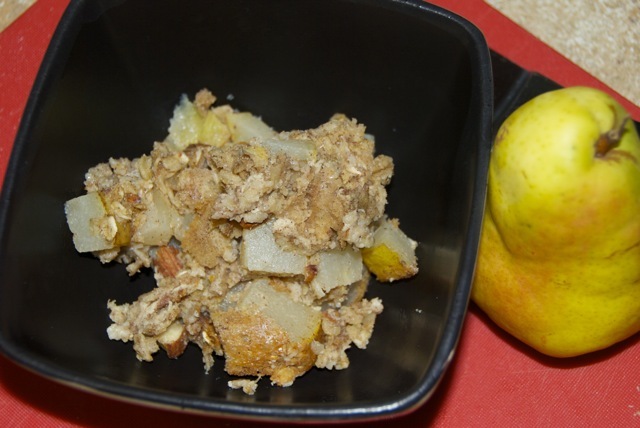 This easy Almond Pear Baked Oatmeal is the perfect breakfast for your busy week. It’s packed with healthy ingredients and can be made ahead of time and quickly reheated! Because I can’t resist a good deal, and because the Commissary has been offering them for 59 cents a pound for the past couple weeks, I’ve been eating a lot of pears lately. Ripe pears, especially Bartletts, are one of my very favorite fruits, so it’s been pretty awesome. But when you go overboard on pears, eating them plain gets a little boring. I was trying to think of something to make with the pears that didn’t involve dessert (trying to be healthy before the holidays, remember? ), when I remembered a breakfast I used to make all the time. Almond Pear Baked Oatmeal! Almond and pear have always been a match made in heaven to me. I think it was all the French tarts I grew up eating. My love of all things frangipane, marzipan and amaretto was certainly catered to while studying abroad in Paris. I know plenty of people who think almond extract is gross, but I swear I could drink the stuff. Anyways, this is a breakfast I concocted with a little bit of trial and error. The result is warm, almondy and oh so delicious. This easy Almond Pear Baked Oatmeal is the perfect breakfast for your busy week. It's packed with healthy ingredients and can be made ahead of time and quickly reheated! In a large bowl, combine oats, sugar, baking powder, cinnamon and salt. Beat in milk, egg, extract and yogurt. Stir in pear and almonds. Pour mixture into an 8x8 inch pan, sprayed with nonstick spray. Cover with foil and bake 30 minutes. Remove foil and bake an additional 10 minutes. Serve as is, drizzled with a little maple syrup, or with a little milk poured over top. The milk works especially well when reheating leftover portions! Note: Photos updated 3-8-17. Original photo below.